Area rents surpass $1,200/month (average) and set a new record. That number represents a year-over-year increase of more than 14 percent. The good news is that with additional units entering the apartment inventory (and more in the pipeline) the average vacancy has increased slightly, and is now at 2.41%. With more inventory available perhaps rental rates will stabilize, and maybe even pull back a bit. 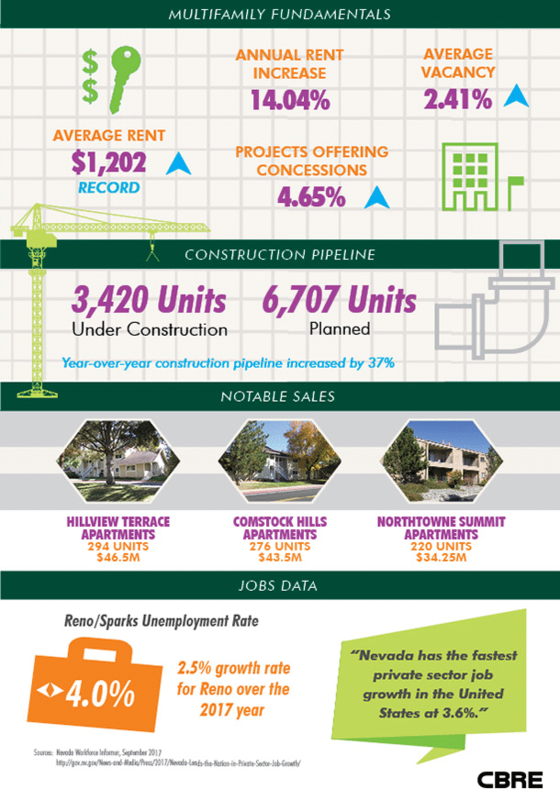 Year to date, Reno continues to break performance records with never before seen rent levels and job growth as new company relocations are announced in the market. We expect rent growth to remain fairly strong but vacancy rates will continue to inch up toward the latter part of the year and in the beginning of 2018 with the delivery of several new properties. We expect tenants to start focusing on more affordable markets outside of Reno like Carson City where both rents and construction are starting to accelerate due to new freeways opening access to those markets such as the extension of USA Parkway and the extension of US Highway 50 to Lake Tahoe. This entry was posted in Real Estate Industry and tagged average rental rate, Reno rental market. Bookmark the permalink.